Émile Durkheim (April 15, 1858 – November 15, 1917) was a French sociologist. He is known for his contributions to sociology and anthropology. He is considered as one of the founding fathers of sociology. He thought that sociology should be scientific. Durkheim was born in the eastern French province of Lorraine. He studied at École Normale Supérieure. He made contributions on topics such as education, crime, religion, suicide, and many other topics related to sociology. 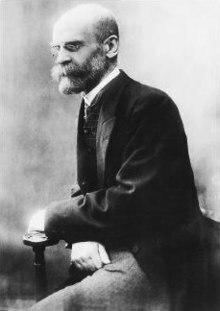 Durkheim died in Paris, aged 59. This page was last changed on 20 January 2016, at 20:13.